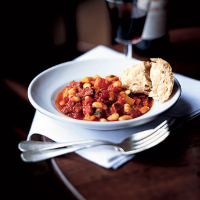 This is a hearty one-pot dish, where the gutsy flavour of chorizo really complements the beans and squash. Serve in bowls with a chunk of crusty bread for a warming dish that's guaranteed to keep out the cold. Heat the oil in a large saucepan and cook the onion and garlic for 5 minutes, or until softened. Add the chorizo and red chilli, and cook for a further minute until the chorizo releases its red juices. Add the tomatoes, sugar, pepper and 150ml cold water. Cover and simmer gently for 10 minutes. Stir in the squash, cover and simmer for a further 45 minutes, stirring occasionally, until the squash is tender. Finally, add the cannellini beans, simmer for 5 minutes and stir in the parsley. Serve immediately. The spicy flavours of the chorizo would be complemented by a soft red.